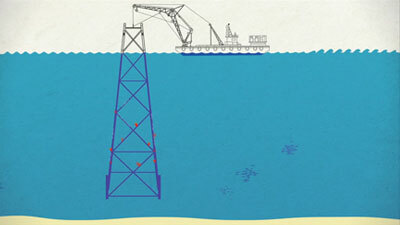 Decommissioned petroleum platforms (commonly known as oil rigs) are the heart of the Texas Artificial Reef Program. An oil or gas rig may be decommissioned because the well is no longer producing or for other economic reasons. These structures make ideal reefs because they are environmentally safe, are constructed of highly durable and stable material and already support a thriving reef ecosystem below the waterline since many of the structures have been in the water for 30 years or longer. Obsolete petroleum structures are inspected before any reefing takes place to locate environmental hazards. All decks (where oil production occurs) are removed and taken to shore for recycling or reuse. All equipment associated with the deck is removed in the process (such as drilling equipment, tanks, pumps, buildings and so on). Insides of legs are inspected to assure they contain no petroleum. All wells below the structure are plugged by the company, according to standards set by the U.S. Bureau of Ocean Energy Management (BOEM). After an offshore petroleum company has finished production of oil or natural gas at a platform, an agreement between TPWD and the company can lead to recycling the platform as an artificial reef. First, workers cut off the deck, and a crane barge lifts it onto a barge, which ships it to shore for dismantling. Commercial divers set explosives inside the legs 15 feet below the mudline. After the charges are set, the base of the platform is loosened from the seafloor and a crane barge lifts it to the surface where it is either placed on top of another barge for towing or is towed underwater to a designated reef site. 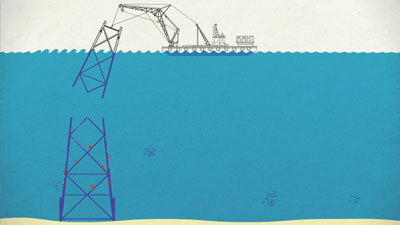 Once at the new reef site, it is placed on its side on the sea floor. Marine life such as fish, coral, sponges, and turtles thrive on this new reef for divers and anglers to enjoy. From a rig to a reef—the transformation begins quickly. Marine species, including fish, find the structure immediately. Settlement by invertebrates is well established within a month, and after six months to a year, the site is well established as an artificial reef. Similar to having bare soil in your back yard, within days to weeks there is spotty growth and then successively, a diversity of plants and marine animals appear. Historically, obsolete rigs had to be moved onshore and dismantled, disrupting the complex marine communities they attracted during their service and costing oil companies millions of dollars in disposal costs. As oil and gas activity in the Gulf declined in the 1980s and more and more rigs were being scrapped, TPWD developed a comprehensive planning guide for artificial reef development to protect the valuable habitats the rigs had created. The Artificial Reef Act of 1989 directed the TPWD to promote and enhance the artificial reef potential off Texas. The Texas Artificial Reef Plan (PDF, 3.2MB), adopted by the Parks and Wildlife Commission in 1990, guides the Artificial Reef Program. When a petroleum company determines that an oil production platform is nearing the end of its life, it can enter into an agreement with TPWD to reef the platform in place, thereby preserving much of its marine life. First, workers remove the deck and take it to shore for recycling. Commercial divers then cut the upper portion of the legs off at 85 feet below the water line leaving the base on the ocean floor. The upper portion is lifted toward the surface by a crane barge. The crane barge lowers the upper portion of the legs to the ocean bottom and lays it on its side near the base. Since this is the least disruptive type of reefing of a petroleum platform, marine life that was originally growing on the legs is preserved. Over time, both sections of the platform will continue to provide a home for fish, coral, sponges and other marine life for divers and anglers to enjoy.